Did I finish? : In a matter of hours. One-sentence summary: The coming-of-age of Aristotle's brilliant daughter Phythias, who by Greek custom and her father's beliefs, remains hidden behind her veil until her father's untimely death forces her to find a way to survive. Do I like the cover? : I do -- very striking -- and captures the feel of the book. First line: The first time I ask to carry a knife to the temple, Daddy tells me I'm not allowed to because we're Macedonian. Buy, Borrow, or Avoid? : Borrow, buy, just get it! Why did I get this book? : Loved the premise and was grateful it wasn't called Aristotle's Daughter or The Philosopher's Daughter, etc etc. Review: I wish was a) brave enough to do a video review or b) lived near all of you so I could just gush in person about this book, which would be easier than trying to write down with words how reading it made me feel. I loved this book -- it broke my heart about ten times -- and I found Lyon's writing style beautifully sharp, modern, slightly magical, a teeensy bit mysterious, and very, very human. Set in 4th century BCE, the novel follows Pythias, beloved daughter of Aristotle. Brilliant, but not pretty, Pythias' life is unfair: doted on by her father, educated by him and once praised as having one of the most brilliant minds he's come across, but still a woman, and good only for keeping house. She must remain modest, chaste, veiled, silent. When Alexander dies, Athens grows hostile to Macedonians, and Aristotle's family flees to a seaside town, heavily fortified by the army, where he has a family estate. After Aristotle's unexpected death, the impact of his passing is more than just an emotional loss. His mistress, the woman who raised and loved Pythias since she was four, is sent away, neither blood nor family nor a slave bequeathed to Pythias. When the family's stores raided, Pythias finds that the household slaves she loves do not feel the same way. Penniless and adrift, an unwanted woman among her father's acolytes, Pythias first fights to survive and then to find some measure of happiness. Little is known about Pythias, so Lyon created a life for Pythias that is wild, complicated, incomplete (the story ends around, I think, Pythias' mid-twenties.) The strength of this story comes from Pythias, who is smart and striking, emotive and honest. Lyon's writing style is precise and sharp, yet heavy with inference and intimation. Pythias speaks in polite obfuscation at times -- ever the lady -- until her experiences shift her from someone reserved and polite to someone who owns her agency, decisions, voice. The plot follows this subtle transition; at some point the story drifts into the fantastical, but whether it is really magic or just hysteria (we learn earlier from Pythias' young friend about the wandering uterus), there's a disquieting sense that the concrete reality Pythias grew up with may not be the reality of the world she lives in. Technically, this book might be a 'sequel' to Lyon's The Golden Mean, but I haven't read The Golden Mean and I don't think I missed anything. 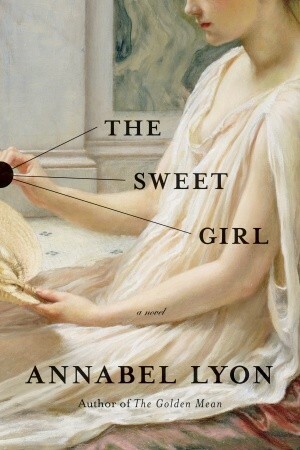 This takes place, I believe, some decades after the events in The Golden Mean and is a vibrant, beautiful novel about growing up in the shadow of someone brilliant, famous, and contradictory; coming-of-age in a brutal way; and the powerful agency claimed by this historically forgotten woman. Edited to Add: Read this article, 'Who Was Aristotle’s Daughter? : Novelist Annabel Lyon on why she wanted to give voice to a Greek girl whose famous father was a screaming misogynist.' to get a sense of Lyon and how awesome she is. Oh, this sounds fabulous! I'm off to get a copy immediately! Can't wait to see what you think of it -- it was unbelievable. I can't write enough joyful adjectives about it! The video blog is on my someday-do list -- I do want to try as it might be easier for me to just squee! ;) And this one is absolutely immersive -- I started and couldn't lift my head until I finished. Oh man, your love of this book makes me want to buy it right this second! My wish list is becoming ridiculous, lol. I feel you about the ridiculous wish list -- mine is out of control -- but this one is super worth adding it to the top (which is what I say about all the ones I love, I know, but really, this one is THAT good!!). Yes, what Kathy said! And for that matter, everyone else! :--) MUST get this! Exactly -- racing to get this one will not be a bad choice! Wow - this sounds wonderful! I've put it on my to read list and need to keep an eye out for it. I love historical fiction, especially novels about characters that I don't know much about. Even better are novels about women and the struggles they faced. Thank-you for the great review! I agree -- I love hist fic about the women we never hear about, too -- and this one was stellar. A rather eye-opening looking at like in ancient Greece -- I would have hated it! What!?! This sounds so awesome! And I love books that make reviewers feel gushy, I totally get that way, too...it's how I know a book deserves some attention. Definitely seeking this one out. Yes -- I hope this book gets noticed -- in addition to the not-so-common setting, Lyon's writing style is literary-ish without feeling literary, very warm and welcoming -- I'm just in love. Can't stop thinking about this one either. I hope you get your hands on it! I love when you gush! :) Gushing reviews are the best, and this sounds like a phenomenal story. Off to read the article, and definitely putting this one on my wishlist. Weeeeelllll, I just requested The Golden Mean from the library, so we shall SEE, madam.